Entspannen und Genießen - Willkommen im Pink Shell House. Unser Haus befindet sich direkt gegenüber vom GOLF OF MEXICO! Zusätzlich sitzt unser Haus an einem schönen breiten Kanal. Sie haben Ihren eigenen privaten Pool, der solar beheizt ist. Das Haus hat viel natürliches Licht. Die Küche ist offen Konzept und hat alles, was Sie für die Unterhaltung benötigen. Wir haben Gäste, die buchstäblich aus allen Teilen der Welt kommen, um an unseren Ort zu kommen, um nach Shelling zu fahren. So viele Dinge, die man zusätzlich machen möchte; Machen Sie einen Spaziergang zum Lover's Key State Park, wo Sie angeln, Kajak fahren und Boot fahren können. Liegestühle, Handtücher und Sonnenschirme sind vorhanden. Unser Dock kann Boote mit einer Länge von bis zu 25 Fuß bewältigen, und die Lage am südlichen Ende der Insel bietet Bootsfahrern Zugang zur Bucht und zum Golf. Entspannen Sie nach einem vergnüglichen Tag am Strand auf den Liegestühlen am Pool und spüren Sie, wie der Stress verschwindet. Wenn Sie Glück haben, können Sie sogar einen Delfin oder Seekuh im Kanal fangen. Sie befinden sich in der Nähe von Geschäften, Restaurants, Yachthäfen, Theatern und einem Golfplatz. Eine Trolley-Haltestelle befindet sich vor unserem Haus und bringt Sie zum Pier am Times Square, Einkaufs- und Restaurantkomplex. Tagesausflug zum schönen Sanibel, Captiva und Neapel oder genießen Sie einige der touristischen Attraktionen in Fort Myers. Unser Haus ist in einer sehr zugänglichen Lage auf der Insel verfügbar - wir werden als Südinsel betrachtet, die sehr praktisch ist, um schnell auf die Insel zu gelangen. We had a wonderful stay at the Pink House. The pool was a big hit for our teenagers and the beach was a quick jaunt across the street for nice long walks. We saw so many manatee right in the canal every day and even some dolphin along with an iguana. Dana worked with us when our dates changed as well and we were very appreciative. Highly recommend!! The Pink House met all of our expectations. Dana was attentive to our needs before and during our stay. 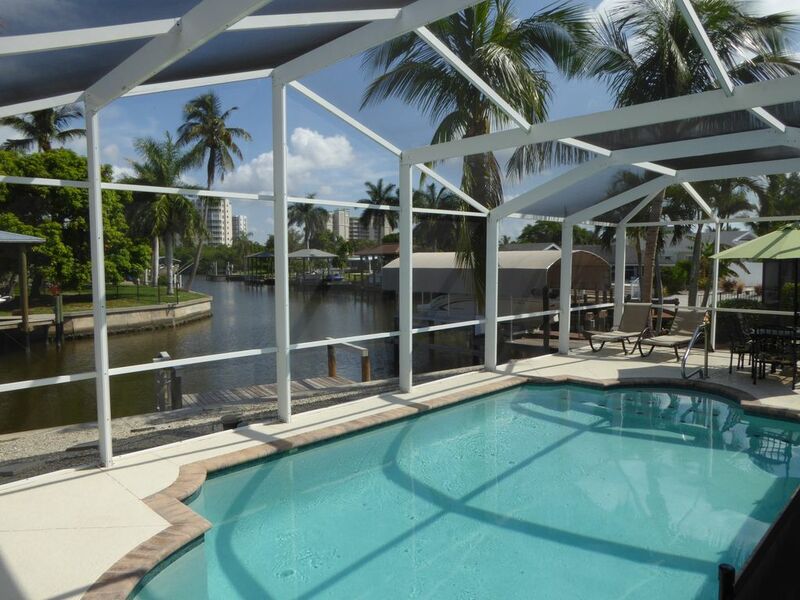 The location of the home is a great launching pad to explore Ft Myers Beach or day trips to Sanibel and Marco Island. We appreciated having enough beach chairs and nice umbrellas and beach stroller/cart for making the walks to the beach easier. We enjoyed the views of the backyard and saw a dolphin swimming in the canal. We highly recommend the dolphin excursion boat ride at Fish Tale Marina. We saw 7-8 dolphins on our ride and it was a refreshing way to spend our last day. Thanks Dana! Thanks Deb and Family- so glad you enjoyed! We really liked this house! There are 2 things that really stood out for us. The first is the location. We like this end of the island as it is not as busy as the north end. And it's close to Bonita Springs if you decide to venture that way. This location is also convenient for heading on/off the island vs. the other end of the island. Being near Big Carlos Pass is great because you see so many dolphins and its a good area for fishing. We saw alot of manatees in the canal which was fun to watch. And being able to walk to the ocean is awesome. Also this house is so close to Lover's Key - beautiful beach there! The other aspect that we really liked is the amount of sun that the pool area gets. And the pool water was the perfect temperature. We spent most of our time either fishing, boating (we brought our boat), hanging by the ocean, shelling or at the pool. We hope to stay here again!!! Spent a wonderful week at the Pink Shell House. The house is updated and clean with two living spaces perfect for a family with kids. Location is amazing, we had almost the entire beach to ourselves and the best shelling ever. A 15-20 minute walk to Santini plaza and the CVS, very convenient. The manatees paid us a visit in the canal as well. Dana is a wonderful host and super helpful. Don't miss this one. I am so glad the manatees showed up for you - always a treat! Thanks for pointing out a lot of the homes special details. The Pink Shell House is an island treasure! My family stayed at the Pink Shell house February 2019. The Pink Shell was most accommodating! The well appointed house had all amenities like home. A blender, a pack and play and a heated pool topped the list! The location, across the street from the beach and nestled on the south end of the island, was the perfect fit for our young and growing family. The Pink Shell house is truly an island treasure! We will definitely return! Thank you Michelle and Family! It was our pleasure to have you stay with us! The Pink Shell is a special place and I am so glad you enjoyed it-. The house was in a perfect area for the beach and to explore south Florida. Clean, light and bright with every thing you need for a great vacation. Come back soon you are always welcome. The cleaning fee for multiple weeks may be higher.